A little while ago, I was sent some vouchers to use on a Tesco must have product. 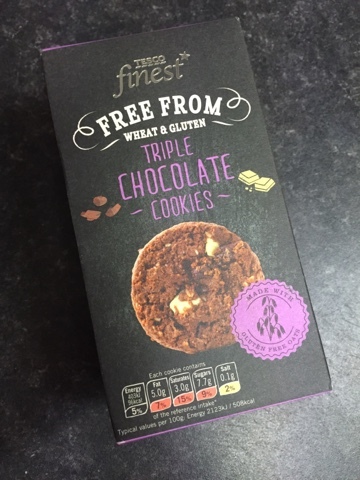 There were a handful of items to choose from, but my sweet tooth led me to choose the 'Triple Chocolate Cookies' from the Tesco 'Free From' range. Tesco's 'Free From' products are marketed as offering 'taste without compromise'. They are specifically designed to make it easier to handle food allergies, as they do not contain ingredients such as gluten, wheat and in some cases, dairy. The range, which impressively contains more than 350 products, aims to leave no one left out, providing great tasting food that can be enjoyed by all. As someone who to their own knowledge has no intolerances, my sampling of such 'free produce' has been somewhat limited. While I am always open to introducing healthier alternatives to my diet, my own perception - however misplaced it may be - was that these might be a little 'lacklustre' in the flavour department. I mean, what if the gluten and wheat are the bits that make things taste SO good. These delightfully moreish little treats are 'melt in your mouth' fantastic.The biscuit is crumbly, but with an almost gooey texture alongside it. 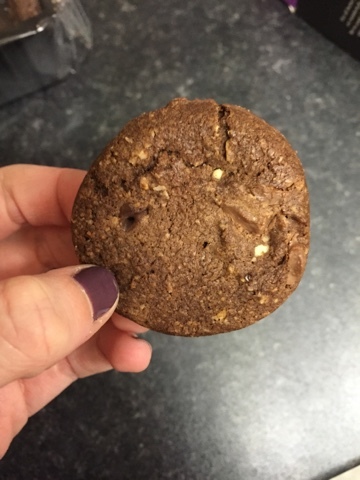 There's a rich chocolate coating along the bottom of the biscuit, as well as yummy choc chips within, so you are totally getting your sweet fix. I was really impressed with how great these tasted, and they completely exceeded my expectations. The prospect of a gluten free diet for one seems much less daunting, as it is so apparent with these that there is no compromise on flavour. The downside of these? There weren't more in the packet. This was a particular issue given that my boyfriend liked them so much he polished off half a packet. Cheek! These treats cost around £2 a packet, and should be found at most Tesco stockists.